Clinton and Kaine at a rally in Virginia last week. Image via AP. On Friday evening, following a rally in Tampa, Florida, Hillary Clinton announced via text message that she had chosen Virginia Senator Tim Kaine to be her Vice Presidential candidate. Compared to Trump’s incredibly messy rollout of Mike Pence as his running mate, Clinton’s announcement was unsurprisingly smooth, with a preproduced video from Kaine praising her. Virginia is a swing state, and as a white centrist male Democrat, Clinton’s team clearly hopes Kaine will help her with Republicans who don’t want to vote for Trump/Pence. But he also speaks fluent Spanish, which they also likely hope will benefit her among Latino voters, whom she’s currently trying to appeal to in Florida. (Whether Kaine will give her the bump she wants is, as with all VP noms, a gamble.) His brief commentary on Twitter during last night’s Trump RNC speech certainly mirrored Clinton’s response to the same today. 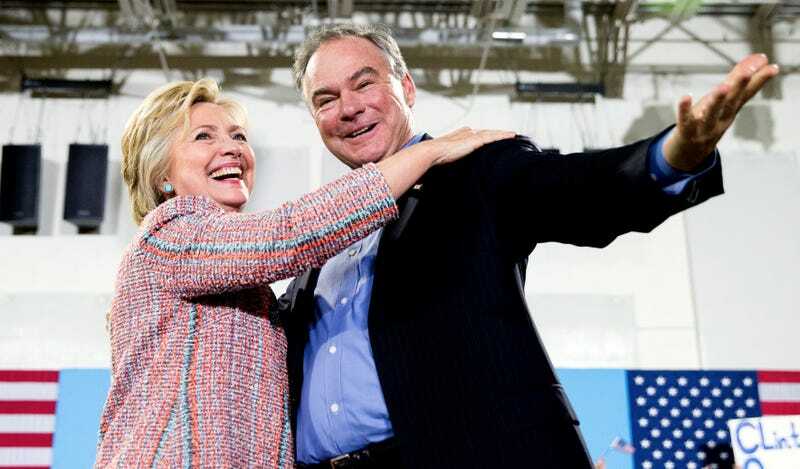 Kaine will accompany her to the Democratic National Convention in Philadelphia next week. What Demographic of American People Will Hillary Try to Appease With Her VP Pick? Should Hillary Clinton&apos;s VP Be a Dog?